One of the most renowned orchids in cultivation is flowering now in the Orchid Display House. Meet Paphiopedilum rothschildianum, Rothschild's Slipper Orchid. Of all of the species of Asian Slipper orchids it is thought to be one of the rarest in nature. 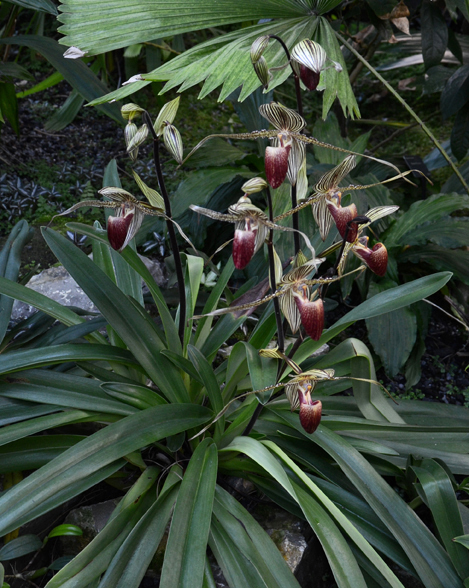 You can't miss its regal presence among the other slipper orchids growing on our limestone outcrop. Our plant measures about 2' in diameter and has 5 flowering spikes. Rothschild's Slipper Orchid, which Phillip Cribb in The Genus Paphiopedilum (1998) describes as 'arguably the most handsome in the genus' was one of the most sought after orchids at the height of the 19th century orchid mania. Its story of repeated tragedy has made it a poster child for conservation of orchid habitats. Harold Koopowitz tells the story in Orchids and Their Conservation (2001). Paphiopedilum rothschildianum occurs only on Mt. Kinabalu* on the island of Borneo. It was collected and introduced into cultivation in Europe and Britain in 1887. The original site appears to have been deliberately falsified by the collector, Sander & Sons, who gave the location as New Guinea in order to mislead rival collectors. For the next fifty years the exact location of this extraordinary orchid was a matter of conjecture. In the late 1950's two populations were discovered at the base of Mt. Kinabalu. In 1959 many of the plants in flower were collected to decorate a bower welcoming Prince Philip to Kota Kinabalu, according to Koopowitz. The sudden reappearance of this magnificent orchid would certainly have been noted by attentive orchid collectors worldwide. Some plants ended up in cultivation, and many of the rothschildianums in cultivation today are descended from these. In 1979 a third population was discovered in an area of Kinabalu park which subsequently lost its protected status. Plants outside the park are threatened by shifting agriculture, logging, mining and commercial development. An attempt at propagation and reintroduction onto Kinabalu in the 1980's ended catastrophically when the reintroduction site was burned. 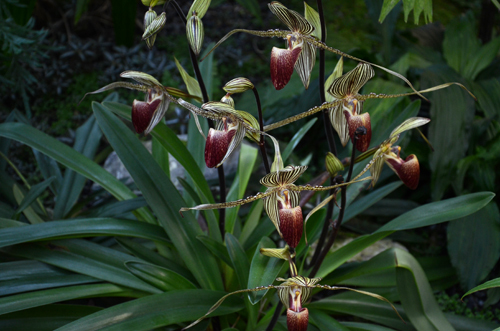 Follow the link to find out more about the very strange and slightly macabre pollination mechanism of some slipper orchids, including Paphiopedilum rothschildianum. *Mt. Kinbalu has a diverse flora that includes over 1200 species of orchids, an impressive figure compared with the fifty-something orchid species in our state.